I had my first ever Polar Express Pajama Day this year! I wanted to do something different for our Christmas party and I wasn’t sure what until another teacher asked if I wanted to join her class for a pajama day and movie. I agreed and after thinking about it I suggested that we should combine pajama/movie day with our Christmas parties…she agreed! So our first annual Polar Express Pajama Day was born! The children were super excited…before the movie stated they had to find their spots on the carpet and get their tickets punched. 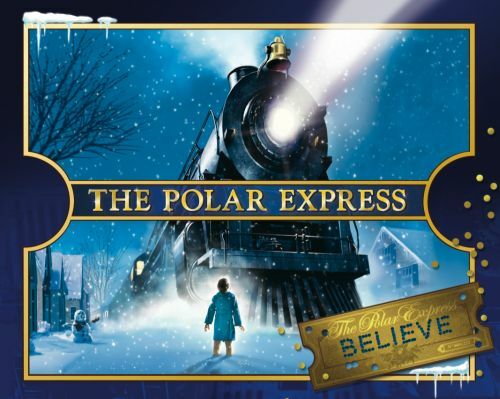 I found printable polar express tickets online here and copied them on goldenrod paper. This alone, made the kids super excited and our day hadn’t really started yet! I was amazed how quietly 22 3 and 4 year olds sat waiting to get their ticket punched. We started the movie. During the hot chocolate scene the children got another surprise….they all got a cup of creamy homemade hot chocolate that I had made that morning in my crock pot! It was a bit of an ordeal getting to work early and finding a place in the classroom next to an outlet (I only have 2 outlets in my room) but well worth it! It was sooo yummy! We finished the movie and at the end the school secretary came in and said we got a package in the mail from the North Pole! You should have seen the looks on the kids faces! It was priceless! I opened the package and inside we found a letter from Santa and a bell for each child! (Okay, don’t tell anyone but I wrote up a letter and the other teacher got bells from the Dollar Tree) Just like the bell in the movie! The kids actually cheered. It was awesome. We both agreed to do this every year…I couldn’t have asked for a better morning. Today we had a class pajama party! It was in honor of Ms. Bennet’s birthday! The children were very excited because even Ms. Bennet and I wore pajamas! They just couldn’t get over that. Ms. Lezze-Faire even got into the spirit – she came to visit our class for a few minutes today and joked about how we all forgot to get dressed on the same day! The children laughed and told her she was being silly – we were having a pajama party of course! It was great. We did our usual morning routine of journals, morning message, and circle time. Then we had our snack of cupcakes and juice – and sang “Happy Birthday” to Ms. Bennet. We told them they could bring a stuffed animal to school (which is very special since I don’t usually allow toys from home) and so we went around and everyone told us about the special friend they had brought with them to school. Next we let them all take their shoes off and get comfy on the carpet with their stuffed animal to watch a movie. We watched “The Sword and the Stone” – Ms. Bennet’s favorite children’s movie. After the movie I let the children dance with thier stuffed animal. They loved this part. Then I told the children we were going to play sorting games. First I told them to sort themselves into boys and girls. Done. Then, short sleeve/long sleeve. Got it. Then by various pajama colors: pink, purple, red, and blue (everyone’s pajamas fell into one of these color categories). This one took a little work – but we got it. Then I told them to sort themselves by sock color, white/not white. They got that easily. After each sorting we counted each group to see which one was the biggest. Fun times. Sporatically throughout the morning I would turn into the “Tickle Monster” and run around tickling various children that came near me! They loved this too! Then as a special treat we ate lunch in our room with our stuffed animals! This excited them because we never eat lunch in our class! It was a great day!